REVIEW – I know what you’re thinking… why would I need a wallet for my wetsuit? But the Reborn Rubber Wetsuit Wallet isn’t for diving, but is a durable, upcycled card carrier with an eco-friendly mission. Reborn Rubber’s Wetsuit Wallet is a slim, front pocket style wallet made from “upcycled” wetsuit neoprene and polyester. 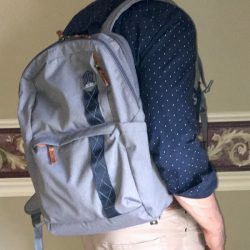 I’ve been a big fan of recycled or repurposed items for wallets and bags ever since I saw someone selling duct tape wallets at a craft fair some years ago. There are just so many things that get thrown away instead of reused, and apparently, diving wetsuit neoprene is a great material to use for wallets. Slim, front pocket wallets are absolutely my jam. 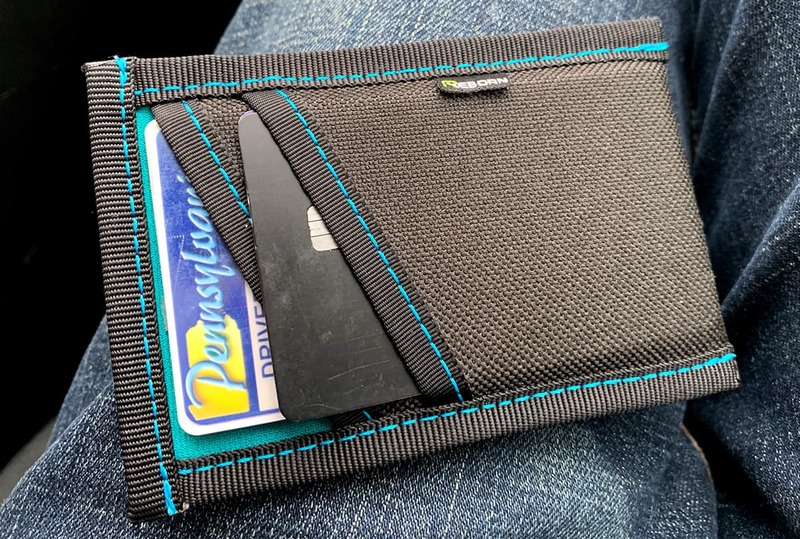 The Reborn Wetsuit Wallet’s construction is simple and durable, as well as inexpensive. $20 gets you a slender wallet that easily fits right alongside your phone in a front or back pocket. Nearly every material used in the manufacturing of this wallet is recycled. 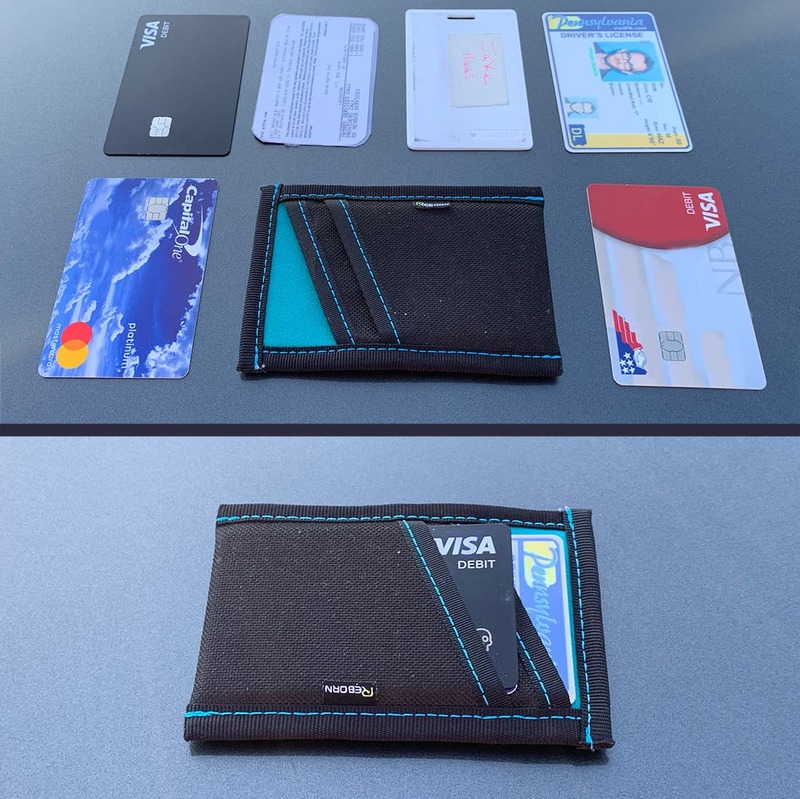 Since the center of the wallet is made from neoprene, it can float in fresh or salt water, even fully loaded. 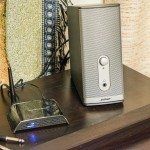 So it’s great for those trips to the lake or dock. And obviously, it’s waterproof. The stitching looks to be rock solid, however, there is not a lot of flex in the top openings of the card pockets. 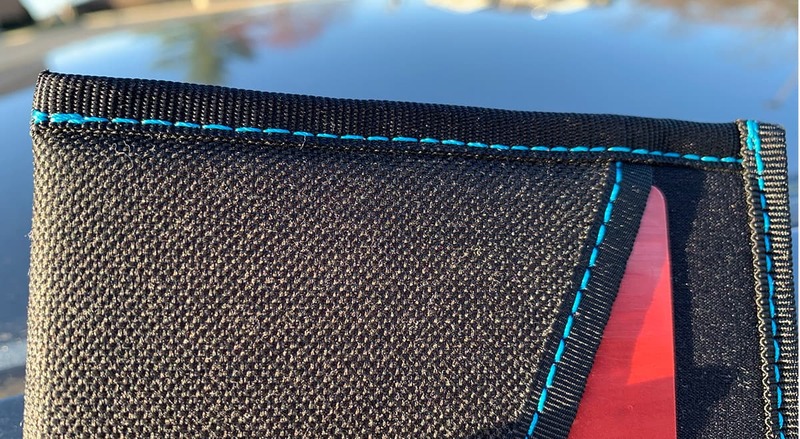 A detailed shot of that stitching. I’m a bit dubious about their claim of fitting 5 cards in each pocket, plus one in the back. 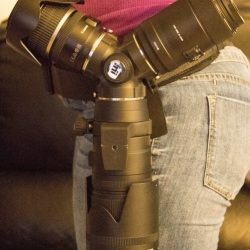 I think you could cram them in there (I didn’t have 10 cards laying around to test this out) but the stitching and material at the top of the pockets doesn’t have much give. Perhaps after a couple months of breaking in, they loosen up, but even then, any more than 3 cards in each pocket would be my max carry. I’d say 5-8 cards is just about a perfect fit. It’s difficult to remove any but the top card on the pockets because of this. You can easily slide all of the cards in a pocket out as a group. 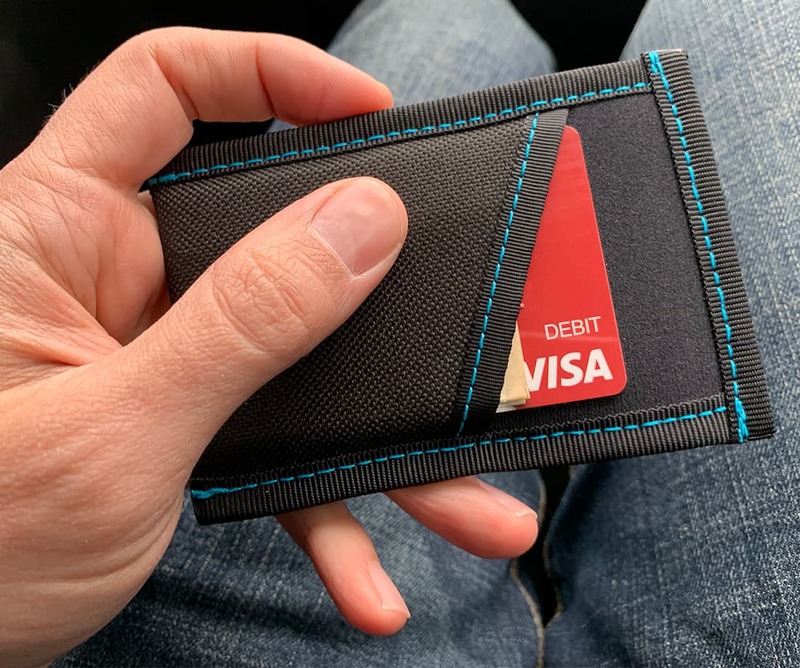 To me, the point of many slim wallets like this is to actively carry fewer cards, just the basics. For me, it’s my license, office door keycard, and three other cards. So I love wallets like this one. Actually, the only negative thing I could find to write about is their card-fitting claim. You could carry 11 cards, but I personally don’t think you should. 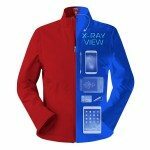 I really like the color-match stitching. Nice touch. One of my favorite features of this wallet isn’t even the wallet itself. Reborn Rubber is a part of a growing group of companies who use upcycled materials in their products. Not only that, but they give back a portion of their profits toward cleaning up the oceans. Plus, if you’ve got a used wetsuit laying around, you can donate it to Reborn Rubber to convert into wallets and provide up to $110 in ocean cleanup efforts, and they’ll even send you a free wallet for donating. 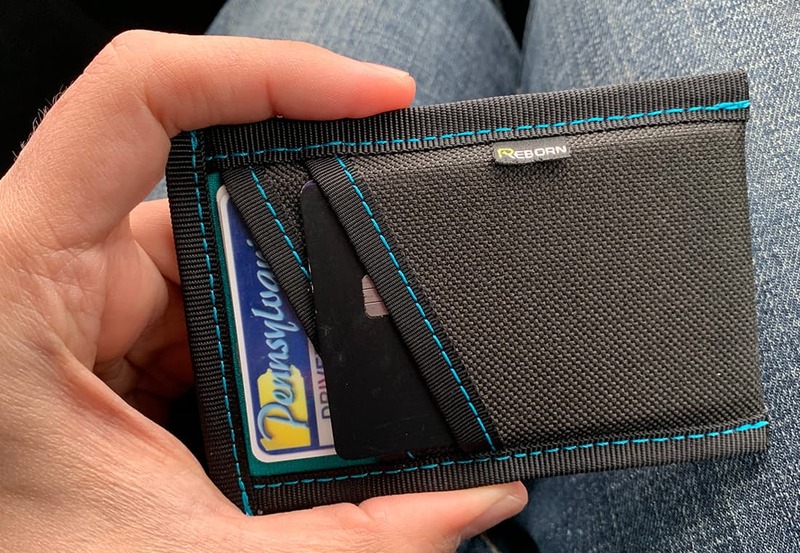 If you’re looking for an inexpensive, slim, waterproof, floating, super durable wallet that gives back to the planet, the Wetsuit Wallet is just lovely. Where to buy: You can get your own Wetsuit Wallet in a multitude of colors directly from Reborn Rubber’s website. Source: The sample of this product was provided by Reborn Rubber.